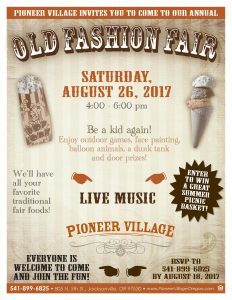 Pioneer Village invited you to come to our annual Old Fashion Fair on Saturday, August 26, 2017 from 4 pm to 6 pm. Be a kid again! Enjoy outdoor games, face painting, balloon animals, a dunk tank and door prizes. We’ll have all of your favorite fair foods and live music! Everyone is welcome to come and join the fun! Enter to win a great summer picnic basket. Please RSVP to 541-899-6825 by August 18, 2017.